The Tabaski Festival occurs every year in Senegal and The Gambia as well as much of West Africa. It is the same Islamic holiday that Muslims in other countries celebrate and call Eid al-Adha. For the festival which this year is held on August 22nd, every family has to buy and then slaughter a sheep or ram. Last year I was in Dakar, the capital of Senegal for the month of August, the following photos were taken during this period in the lead up to the Tabaski Festival. (Click through the slideshow below to view all of the photos). 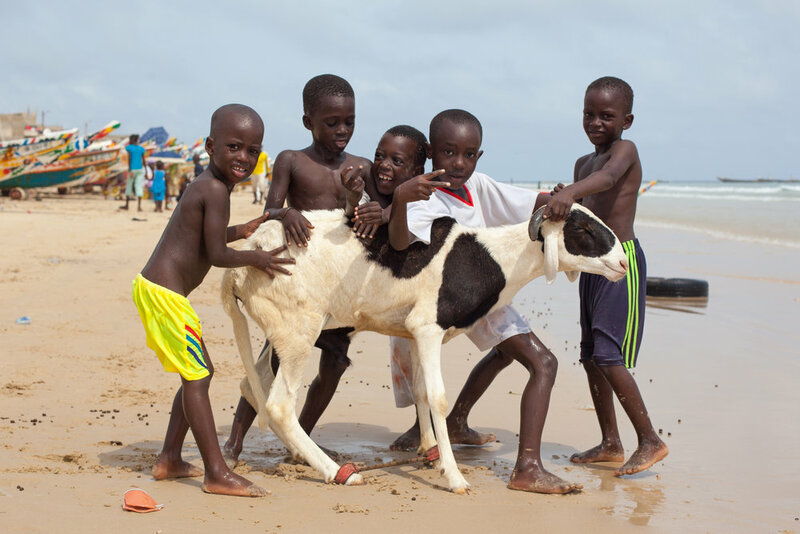 Children pose for a photo with a sheep before the Tabaski Festival on a beach in Dakar, Senegal. 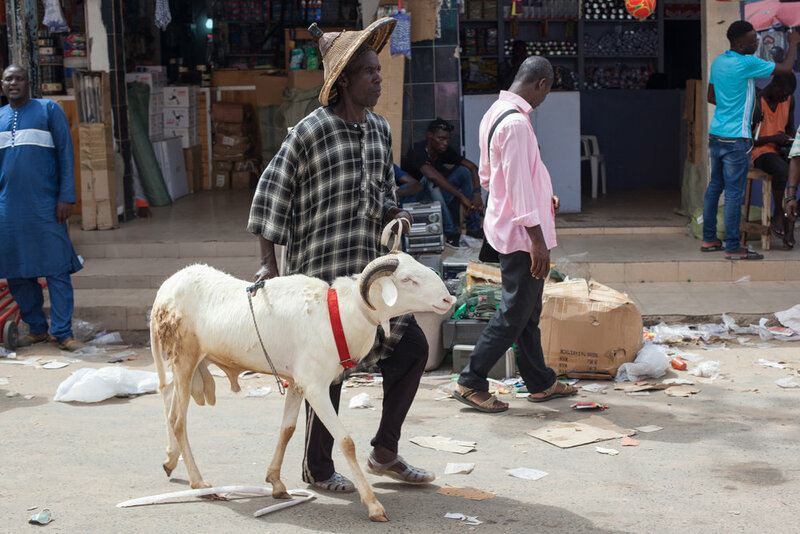 Selling sheep at the market in Dakar, Senegal before the Tabaski Festival. Sheep portrait in Dakar, Senegal. Children washing sheep in the ocean at Yoff Beach in Senegal. Sheep on the beach at Yoff in Dakar. Washing a sheep in the ocean in Senegal before selling it for the Tabaski. 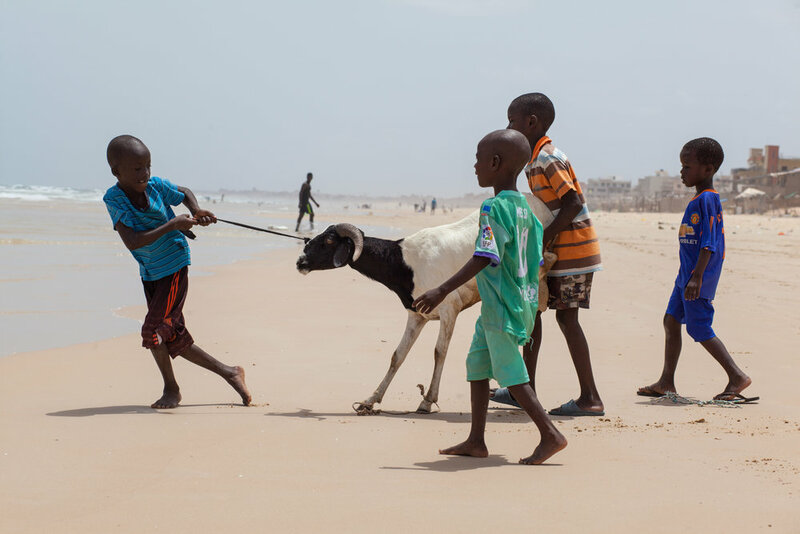 Children lead a sheep into the ocean for a clean prior to the Tabaski Festival in Senegal. What is the Tabaski Festival in Senegal? The Tabaski Festival is the biggest public holiday in Senegal. Senegalese people return to their families from different parts of Senegal and even from overseas to celebrate the event. If you visit Senegal during August, you will see sheep everywhere. Penned on roads and pavements, tied to posts and cars. On the beaches you will see children washing the sheep in the ocean and playing with them on the sand. You will see them tied on the top of buses, riding with humans inside the buses and just about everywhere else that you look. 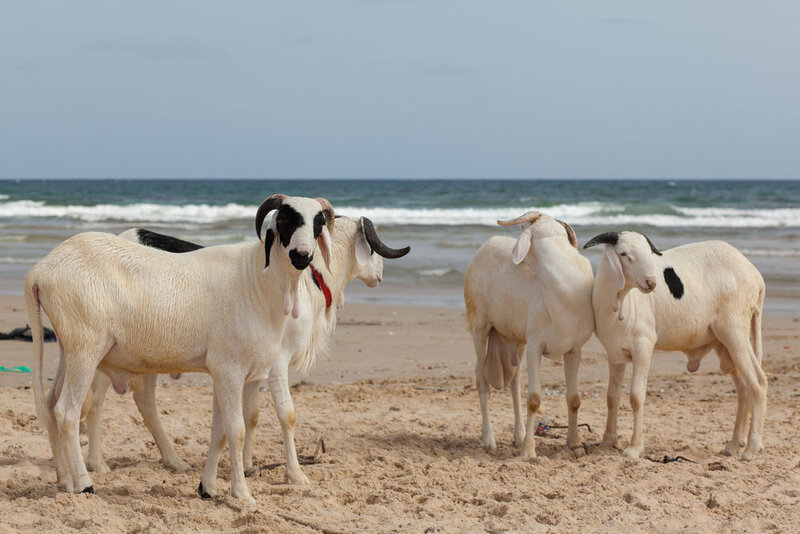 There is even a national beauty contest each year in Senegal to determine the countries most beautiful sheep. In Senegal, the government runs a program codenamed Operation Tabaski to provide animals for those families that can not afford one. Incidentally, I know in the photos the animals sometimes appear to be goats but I was reassured that they were in fact sheep. After some online research I learnt that one of the ways to differentiate between the two is by their tails: sheep's tails hang down, goats tails are smaller and point up. On the day of the Tabski festival following an important morning mosque service families return home to slaughter the animal and prepare it for the family feast. In total up to four million animals are sacrificed every year in Senegal for Tabaski. The entire animal is apparently used with nothing wasted, not even the intestines or horns. The day following the festival however I did see a large number of sheep carcasses on the beaches of Dakar. Tabaski Festival is based on Islamic beliefs and could also be referred to as the feast of sacrifice. According to the holy Koran Prophet Ibrahim was commanded by God to take his son, Ishmael up on to a mountain and slaughter him as a sacrifice. Although Christians and Jews argue that Isaac was the son to be sacrificed and not Ishmael, all sides agree that Abraham was obedient to God and was ready to kill his son when a ram was provided as replacement instead. More of my travel photography from Senegal can be found on my website, Instagram, Facebook Page and my Flickr account. If you would like me to be involved with an Instagram takeover please send an email to: geraintrowlandphotography@gmail.com.